The U.S Navy christened its newest, most technologically advanced aircraft carrier yet. On Saturday, USS Gerald Ford was christened by former president Ford’s daughter Susan Bales Bord, who is also the ship’s sponsor. After the traditional smashing of an American bottle of sparkling wine on the ship, Susan Bales Bord gave a speech to the shipyard workers, Navy personnel, and military dignitaries. The Gerald Ford is the lead ship for the Navy’s future class of nuclear-powered aircraft carriers. 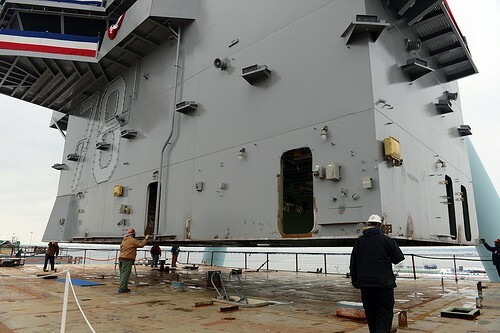 The Navy will plan on having the Gerald Ford join the fleet in 2016. The Ford class is the first new aircraft carrier design in over 40 years, so it has extraordinary benefits such as the ability to launch jets faster than past aircraft carriers, require less crew members, incorporate unmanned aircraft into its air wing, and save the Navy $4 billion over the ship’s 50 years of service. Above all the new advancements of the Gerald Ford, its namesake is also very unique for this aircraft. Former President Gerald R. Ford, who died at age 93 in 2006, was a lieutenant commander of an aircraft carrier in World War II and became president in 1974 but lost the election to Jimmy Carter in 1976. 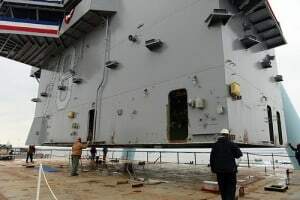 As a heroic commander and inspiration to the American people, the new Ford class of aircraft carriers will carry a name that’s worthy of this new and pristine line of Navy vessels. The BRP Ramon Alcaraz is now the Philippine Navy’s newest warship and it is now in San Diego! Before reaching Manila, BRP Ramon Alcaraz will be docked in San Diego, according to the Philippine Embassy. Earlier news has stated that it may take about two months for the BRP Alcaraz to reach the Philippines. Since its departure in May, the 378-foot-long BRP Ramon Alcaraz has been testing various parts and weapon systems aboard the new frigate. During its voyage to San Diego, the Navy was able to complete successful testing of the ship’s main weapon system, a 76-mm Oto Melara cannon during its journey off the coast of Florida. According to the Philippine Embassy, the ship’s new commander, Captain Ernesto Baldovino, was impressed with the results taken from the main weapon system testing. The test-firing of the BRP Ramon Alcaraz consisted of shooting at targets within a 2 to 3 mile distance. At a cost of $15.15 million for repairs, refurbishing, and refitting, the BRP Ramon Alcaraz has undergone many different types of repair since its crossover into the Philippine Navy. 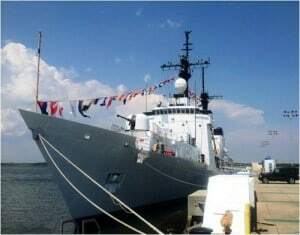 The BRP Ramon Alcaraz was named after a Philippine Navy officer called Commodore Ramon Alcaraz, whom was extremely successful in commanding a patrol boat that shot down three Japanese aircrafts. BRP Ramon Alcaraz is a new Philippine Navy Gregorio del Pilar class frigate. Its recent switch over to the Philippine Navy proceeds its extensive history serving the U.S. Coast Guard. From 1968 to 2012, BRP Ramon Alcaraz was actually the USCGC Dallas, serving as a high-endurance cutter. The warship was decommissioned in March 2012 and thus acquired by the Philippines under the Foreign Assistance Act. 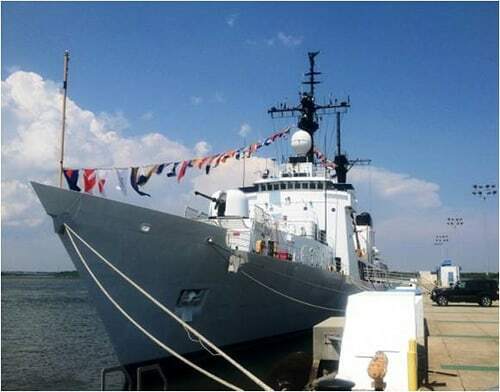 Ramon Alcaraz is one of many ex-US Coast Guard vessels that will now help to serve the Philippine Navy. Following the removal of Commander Allen Maestas, the U.S. Navy has released many of the racy emails and flirtatious phone texts that were sent to multiple female sailors in inappropriate contexts. Under Maestas’s command, many of the female sailors were filing complaints against this Navy official’s unacceptable behavior and questionable comments. In accordance with the Freedom of Information Act, the request to view these messages, texts, and emails has been granted. It is clear to see why the removal of such an official was deemed necessary. Commander Allen Maestas was removed from his post on May 16. He was second-in-command of a San Diego-based unit, however, his inappropriate behavior with senior-subordinate relationships proved to amplify any reasons for his departure. To one sailor in particular, Maestas was texting her comments about joining her in her pajamas and asking for photos of her in shorts or â€œin any pose.â€ Ex-Commander Maestas had also sent messages to other women under his commandâ€¦ the content was relatively similar to the ones listed above. In a statement given by one of the other women, Maestas had offered to wash her vehicle if her boyfriend was unwilling to do so. This particular sailor was so shaken that she traded in her truck to avoid any similar comments to be made in the future. This case is just one of the many that has recently been brought to light. This case will set an example as to how the military will continue to handle these sexual assault issues. Two trained U.S. Navy dolphins discovered a rare find near San Diego’s Coronado on the ocean floor. This team of Navy dolphins found a Howell torpedo dating back to the late 19th century, one of the most technologically advanced torpedoes of its day and only the second one known to exist! The Navy dolphins were bottlenecks being trained to identify objects undersea such as mines that many costly machines cannot even trace. Braden Duryee from the Space and Naval Warfare Systems Center Pacific stated, â€œDolphins naturally possess the most sophisticated sonar known to man.â€ This is no surprise then that dolphins, not a high-tech device, found the unknown Howell torpedo. The dolphins trained at San Diego’s Coronado Island are tested by identifying different shapes on the sea floor when visibility conditions are poor. The shapes used by training specialists look like mines of U.S. adversaries. When the dolphins are ordered to search and dive they will return and touch the front of the boat with their noses signaling that something was discovered. If the dolphin returns are taps the back of the boat, nothing was found. About a month ago, a San Diego Navy dolphin named Ten surfaced to the boat with a positive sign of something found in a place where nothing was to be expected. A week afterwards, a dolphin by the name of Spetz came back with the same positive results and was ordered to take a marker to the discovered object. After Navy divers and explosive-ordnance technicians, the two identified objects were classified as inert; one piece was engraved with USN No. 24. The torpedo’s two halves were taken onshore for cleaning and identification. Once confirmed that the object was a unique torpedo from the 1800s, Navy officials reported that it is their rarest find to date.